A boys’ night out on Saturday brought us to Garufa, and Argentinian grill in Highbury. It was an excellent evening – the food hit the spot, even if the only empanada I really liked was the one our waitress warned us against ordering (the beef, since you ask), and was reasonably priced too. With a bountiful platter of assorted steaks for two to share costing £22, even after the addition of a few sides a main course doesn’t cost any more than a gastropub’s equivalent. The atmosphere was good, the staff helpful (dodgy empanada recommendations notwithstanding), and even the location, inconvenient to many, was but a breeze for those who live near the No4 bus route. But what of the wine list? An obsessive focus on Argentina was to be expected, but at these prices you expect them to be hand-delivered on horseback by a smiling Patagonian gaucho. I’m no restaurateur, and I know nothing of the finances of restaurant ownership, but as a customer any mark-up significantly higher than 200%, or double the retail price, starts to make me uncomfortable. And these were much higher than that. 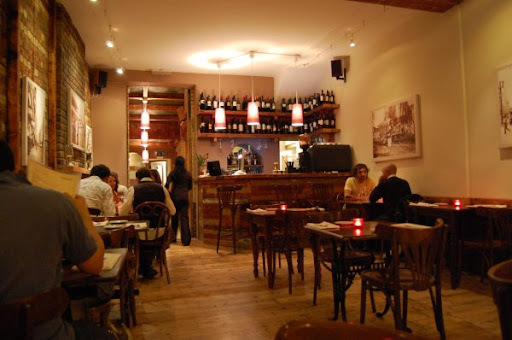 But what really got my goat, as a proud resident of north London, was the fact that the wines at Garufa more expensive than identical, or near-identical wines at its sister restaurant, Buen Ayre in Broadway Market. And not just by a few pence – at Buen Ayre, the Altosur cabernet sauvignon 2006 is £10.80. At Garufa the 2007 is £18. That’s £7.20 extra, just for living in north London. The 2006 La Linda malbec is £17.40 in Hackney and £21 in Highbury. A Textual caladoc, £10.28 per bottle online, jumps from £26.60 (for the 2005) to £30 (for the 2006). At the top end, a Caro cabernet/malbec (The 2004 vintage, as sold at Garufa, costs £25 at Laithwaites) is £90 at Garufa when it (albeit from a younger vintage) costs £95 at Maze, a michelin-starred Gordon Ramsay-operated central-london hotspot that is not situated on a dingy north london road near nothing very much. So we drank the house red, a Norton malbec at £14.50 which was perfectly suitable for the occasion. We had a good time. The meal exceeded expectations. But you didn’t have to be a cow to find the menu a little depressing. This entry was posted in Uncategorized and tagged Garufa, highbury, mark-ups, restaurants. Bookmark the permalink.